This trip covering the famous city of Agra in just one day. 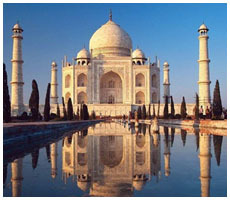 The trip includes a visit to all the famous tourist attractions in Agra. We all know extremely fine Agra is mainly beautiful and fashionable goal in India for it's Historical Culture and Places. Agra is establish on the bank of Yamuna River and well associated via Air, Road or Rail. Agra is established by Sikandar Lodi in the year 1504. Your trip Delhi to Agra start from Delhi railway station to board the air-conditioned train for Agra. Our company representative escorted to the Hotel. In Hotel, our tourist guide introduction to you the famous tourist attractions in the city of Agra. Taj Mahal- UNESCO World Heritage Site and one of the seven wonders. The Taj Mahal is widely known as “The Jewel of Muslim Art” in India and iIt was built by Mughal king Shah Jahan for his wife Mumtaz Mahal (Arjumand Bano Begum) in 1652. Taj Mahal is completely furnished with White marble; it's perhaps India's most fascinating and enjoyable memorial. Taj Mahal the symbol of love eternally, the most famed evergreen monuments in the world. when the leave of Taj Mahal you always remember the sweetness of Mahal in your whole life. Agra fort- built with marvelous red stone by Mughal king Akbar the great in 1573. The fort is made alongside the Yamuna river and spreads over 2.5 km northwest of its additional famous sister monument, the Taj Mahal. During this Fort several necessary places like- the Khas Mahal, the Shish Mahal, the octagonal tower of Muhammam Burj, the reception rooms: Diwan-i-Khas (1637, Hall of personal Audience) and also the several pillared Diwan-i-Am (Hall of Public Audience), created in 1628. Among the palatial complicated, there are two terribly stunning mosques of white marble, the Moti Masjid or the Pearl Mosque (1646-53 by Shah Jahan) and also the Nagina Masjid (1658-1707 by Aurangzeb). You will be escorted for healthy lunch. You'll be able to additionally relax and prepare yourself for additional journey. Fatehpur Sikri was Akbar's capital for about 12 years. He experimented each with design and art and designed a city expressing his ideals and vision. During this space several vital places like- Diwan-i-Am- Hall of Public Audience, Diwan-i-Khas- Hall of personal Audience, Panch Mahal, Buland Darwaza- built in 1575, the tomb of Saint Sheikh Salim Chishti and also visit the Jama Masjid- one amongst the most important mosques In India and it was built in 1571. This place is incredibly famous for its monuments inbuilt Mughal Era. Agra is most famous for his Leather things, Handicrafts things, Marble and etc. When the visit the native market you'll relax in hotel space. Board the Shatabdi Express Train to Delhi. Dinner are provided within the train. Arrival in Delhi Railway Station and tour concludes with happy memories.